IMPERIAL BEACH WAS FOUNDED IN 1887, as a summertime haven of cooler weather for California farmers, laborers and landowners. Today, it has more than 26,000 people, about half of them Latinos, living on a postage stamp of 4.5 square miles. In winter, it’s a surfer town, where wave-riders take advantage of Pacific swells that push against a long stretch of uncrowded beach and produce long, unfurling right- and left-hand breaks. On a chilly, windy morning last January, after the night’s fog had lifted, I visited Imperial Beach, joining about 20 people for a tour of the Tijuana River National Estuarine Research Reserve at the southern edge of town. It was king tide, and I wanted to see for myself what rising seas might bring to California 50 years from now. Like many pockets of nature on California’s coast, the reserve was a respite from freeways, traffic and high-rises. A dirt path snaked through wild buckwheat and broom baccharis along a salt marsh, where two great egrets flew gracefully to their nests. About 350 different bird species live or pass through the estuary, where the Tijuana River meets the Pacific. Our walk ended at the edge of the estuary, on Seacoast Drive. Up and down the street, condominiums were posted for sale, with prices ranging from $600,000 to well above $1 million. At the end of the street, however, where the rising tide was starting to flood by a few inches, the prices had been reduced. (In 30 to 50 years, about 90 percent of Seacoast Drive will be under water.) By 9 a.m., the tide had risen to about 8.5 inches, covering the desert saltgrass to its tips; the year before, it had risen a foot, swallowing the estuary path. A public works employee appeared and began sweeping the pooling water down the street to a culvert. 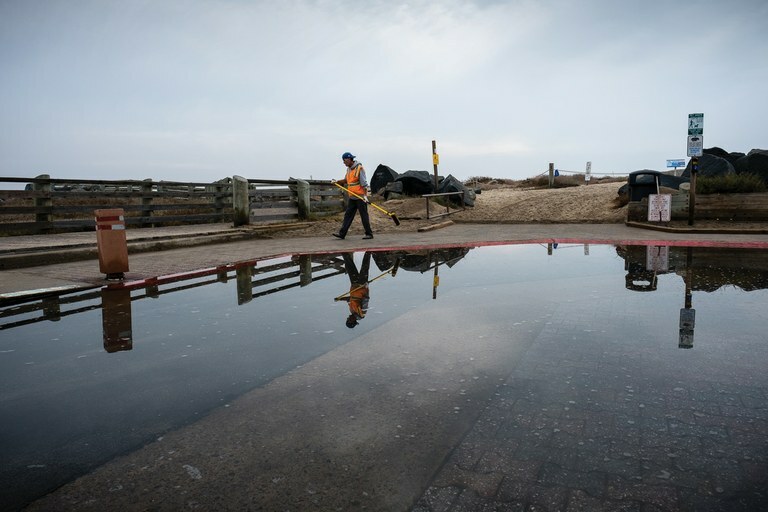 During the January 2018 king tide, a city employee uses a broom to push water towards the drain at the end of Imperial Beach’s Seacoast Drive. 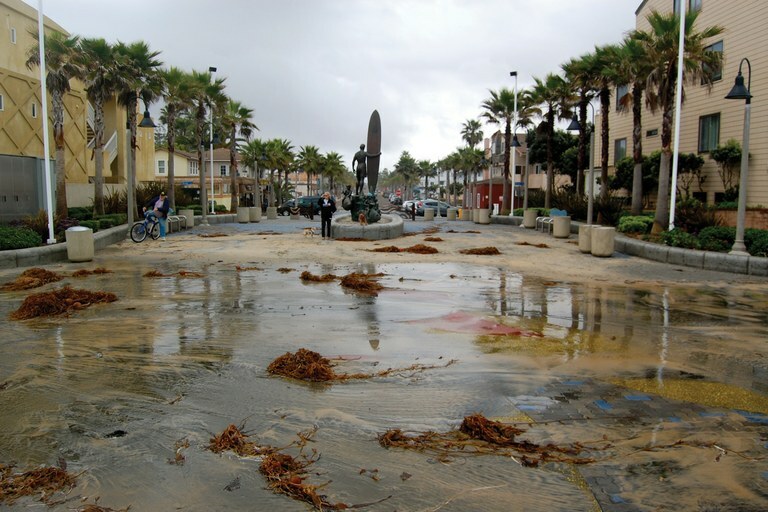 Flanked by the Pacific Ocean on one side and the Tijuana River Estuary on the other, this section of the street typically sees some of the worst flooding in the city during high tide events. A few minutes later, the mayor arrived. At almost 6-and-a-half-feet tall, 54-year-old Serge Dedina cut an unconventional figure for a small-town public official: His hair was bleached blond by the sun, and he sported a casual pair of jeans and sneakers. He shook my hand, wishing me a happy new year before switching gears to talk about flooding. A former lifeguard and lifelong surfer, Dedina has been concerned about climate change since the 1980s, when he first heard the term in graduate school, at the University of Wisconsin-Madison. 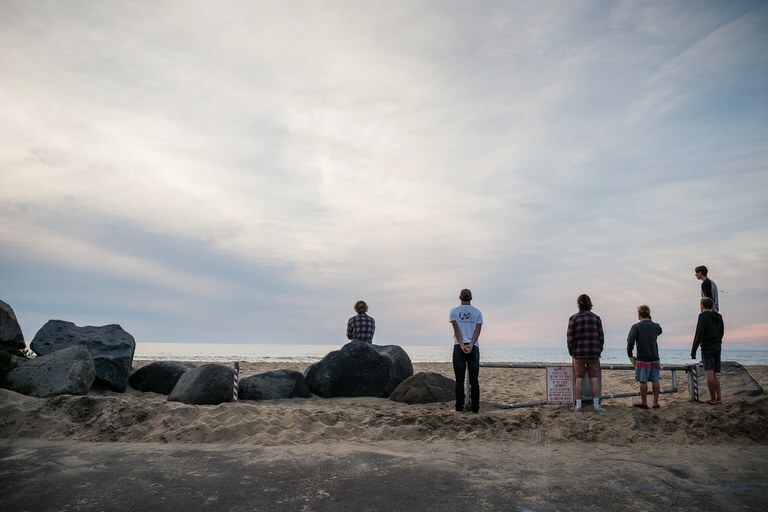 As a teenager, Dedina led a homegrown group of surfers to campaign against a breakwater that would have drastically changed the coast along Imperial Beach. Soon after, he joined the effort to keep this very estuary from becoming a marina — a fight for an open natural ecosystem that would prove crucial to the future of the city. Before becoming mayor in 2014, Dedina led a local nonprofit called Wildcoast, of which he remains the executive director. Wildcoast is a bi-national organization that helps establish and manage protected areas in the U.S. and Mexico. 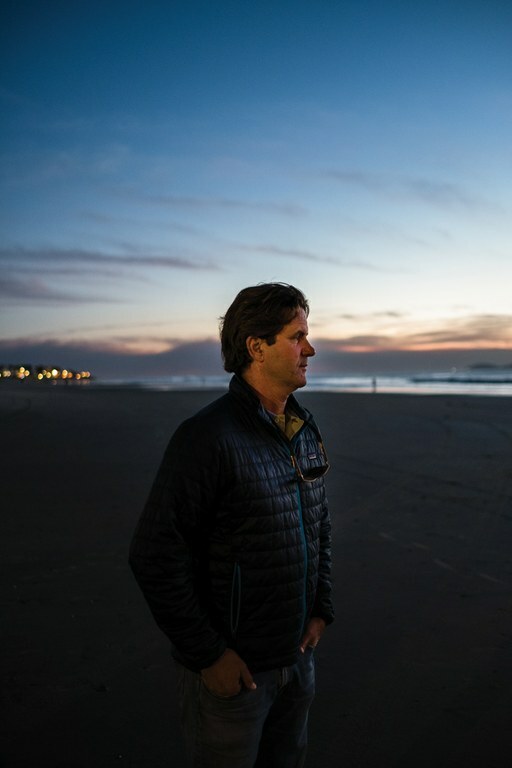 In Imperial Beach, Dedina is renowned for his targeted activism, as well as for building successful partnerships across the two countries to pressure the Mexican government to protect the San Lorenzo Marine Archipelago National Park and the San Ignacio Lagoon, a gray whale breeding zone. But Dedina was facing a completely different challenge now. He wanted the people of Imperial Beach to confront the reality of sea-level rise head-on. He had only been in office a year the last time El Niño hit, in 2015, but, sensing an opportunity to get locals engaged in climate change and its impacts, he called for a public meeting. His office circulated a flier, encouraging people to “take a leadership role by helping your community address coastal flooding issues.” Around 400 residents, including city staff, attended the meeting inside the Tijuana River National Estuarine Research Reserve. People wanted to know how their city was preparing for the next El Niño, and, more importantly, what they could do in the event of even bigger waves and rising seas. They knew from king tides past what rising waters can do, but they were in for a harsh lesson. Depending on how well humanity does at slowing global warming, researchers predict sea levels will rise between 1.6 feet and 6.5 feet globally over the next century. By the time they left the meeting, residents had learned that about a third of Imperial Beach could be underwater in as little as 50 years. Imperial Beach Mayor Serge Dedina watches the waves during the last light of the day on a cool evening in December 2017. As a lifelong resident, surfer and environmentalist, Mayor Dedina is intimately connected to this part of Southern California and acutely aware of how climate change is already impacting it. It is into this quagmire that Dedina has decided to wade. Dedina does not see a future in sand. His city, he believes, will have to do what was once unthinkable: It will have to retreat. Managed retreat represents a planned move away from the coast, allowing the beach to erode for the forces of nature to take over. This, of course, is a gargantuan task. How does a city take all the homes and businesses along its coast and relocate them inland? It has never been done in the Western U.S. before, certainly not on the scale that would be needed — even for a city as small as Imperial Beach. When Dedina came into office, he sought foundation and state money to pay for Imperial Beach’s climate action plan. With help from the National Oceanic and Atmospheric Administration and the Tijuana River National Estuarine Research Reserve, Dedina was able to identify how managed retreat might play out: Seashore developments would need to relocate three blocks inland, while the city as a whole would need to create more density or rebuild some structures, roads and larger infrastructure, including storm-drain basins and schools. 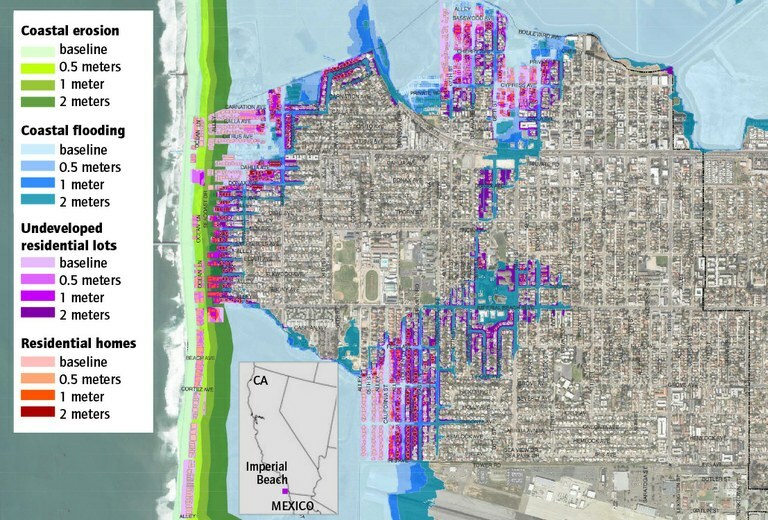 Imperial Beach’s current coastal plan doesn’t take into account findings from a 2016 study that projects how much the sea will rise over time. The city is hoping to update its coastal plan, with input from the community. High seas in March 2014 reached the iconic surfer statue at the end of Palm Avenue in Imperial Beach, California. The adaptation measure isn’t solely Dedina’s idea. Over the past decade, it’s become an important statewide initiative, championed by the California Coastal Commission and the Surfrider Foundation, which have been proposing state laws and coastal development policies designed to make owning and maintaining vulnerable oceanfront properties cost-prohibitive. Some of those new policies ban all new development within 80 or 90 feet of a bluff’s edge, waive a city’s right to build seawalls, and allow public access to open beaches over private coastal property. What comes next, however, is still something of a mystery. With a city budget of $19 million, Imperial Beach simply can’t afford to move. A retreat of three blocks would cost upwards of $150 million. Still, Dedina’s decision is straight-up revolutionary. It goes directly against the American principle of preserving private property at all costs, especially along the beachfront, where homes can be worth twice as much as their landlocked counterparts. It also represents an unusually humble response to the forces of nature, one that admits that we need to deal with the impacts of climate change, to quit fighting the surging waves that we ourselves unleashed. IMPERIAL BEACH IS UNUSUAL FOR CALIFORNIA, and not just because of its conservationist-surfer mayor. It lacks the typical tourist traps, the piers with carnival rides and fancy beachfront restaurants. The properties facing its beaches are nowhere near as glitzy as wealthy beachfront communities like Malibu or Pacific Grove, which have invested heavily in expensive seawalls and offshore breakwaters. Seventy-one percent of Imperial Beach residents are renters, and one out of every five locals lives in poverty, even along the coast. The city lacks the estimated $100 million in taxpayer dollars that it would cost to try to prevent coastal erosion with the help of more berms and sand replenishment projects. By facing the prospect of retreat, Imperial Beach is not just setting itself apart from other California seaside communities — it is challenging them. In May, Del Mar, 30 miles to the north, voted to adopt a sea-level rise adaptation plan. But it did so only as long as the words “managed retreat” were stricken from the document — a caveat demanded by local homeowners. Managed retreat there would allow the rising seas to reclaim the land and some 600 homes on it. “If we implemented management (sic) retreat and required those seawalls that exist today to come out and removed the front row of houses, the ocean would inundate all the way back to the railroad,” Del Mar’s mayor, Dwight Worden, said after the city council vote. “We’d lose the beach; we’d lose those homes.” Del Mar, he warned, would become “a lagoon.” The city decided on more sand replenishment. AND YET WHO CAN BLAME THEM? The prospect of a warmer future is one that humanity has failed to properly imagine — let alone address. 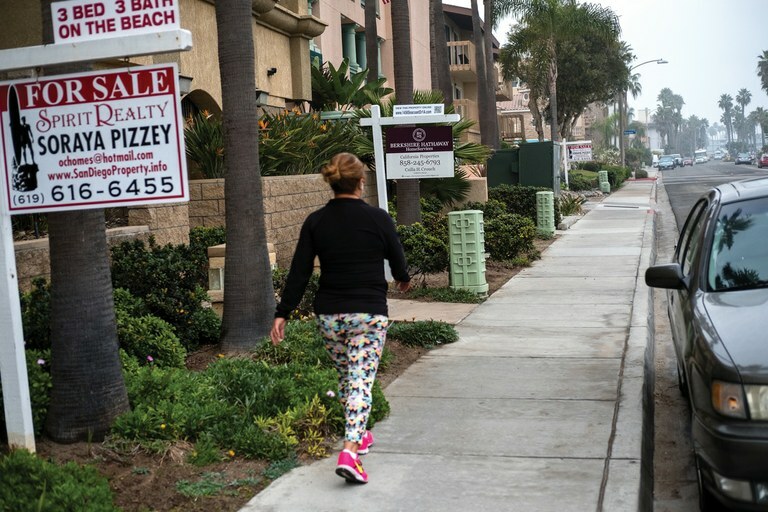 Even in Imperial Beach, where the city has a plan, current residents seem disconnected from the impending future. A group of surfers checks out the swell before deciding to grab their boards for a late afternoon session last fall. Under a managed retreat, in 30 or 50 or even 75 years, the two-level strip mall that houses Katy’s Café would face persistent flooding and would have to be moved between one and three blocks inland. But before that happens, Fallon’s landlord’s flood insurance premium would likely rise sharply, and so would his cleanup costs. In an ideal world, his flood insurance would kick in and pay for the move, but it’s more likely that the property would decline in value with each passing year, and that the insurance company would find a way to avoid reimbursing the property owner for such a massive move. Two blocks south on Seacoast Drive, the owners of a six-story building are determined to stay put. The Pier South Resort, which was completed in 2013 under the previous mayor, cost $34 million, a fifth of which was invested by the city. It is Imperial Beach’s first fancy hotel, bringing in about a half-million dollars in revenue each year. It’s also the first building to include subterranean structural columns that create a sea wall. It’s unclear whether the hotel will set a precedent for other new — and expensive — beachfront developments, or, in a managed retreat future, become an island. Of course, some still hope to safeguard their city. People like Dedina, and the McCoys. Patricia and Mike McCoy, now in their 80s, own a humble two-bedroom cottage on the northern edge of town, in a low-lying area a couple of blocks from the ocean. I sought them out because they were some of Imperial Beach’s first environmental stewards, instrumental in the preservation of the city’s first managed retreat site: the Tijuana River Estuary. They were a living testament to how difficult — and dangerous — managed retreat can be. On the sleepy, foggy day I met them, they sat side-by-side on a couch, their backs to a library full of books about nature and human civilization. “What can I say? Humans are a brinksmanship type of species,” Patricia told me, recalling the years she and Mike worked to protect the largest estuarine system left in Southern California — one that had not yet been destroyed by freeways, railroads, power lines or sewers. Back in the 1970s, developers had already been planning for decades to dredge the estuary, build a concrete channel and create an upscale marina. By the spring of 1974, plans for the marina were in full force. Imperial Beach’s mayor, Brian Bilbray, announced his proposal for a 1.5-mile breakwater over the estuary and a $200 million project that would house up to 7,000 people, a yacht club and commercial development. “And then the developers realized we wanted to save the estuary, and they started to come after us,” Mike said. The McCoys met with local, state and federal public officials and went door-to-door across Imperial Beach, organizing residents against the project, among them a teenage surfer named Serge Dedina. They settled on a strategy: They would convince the U.S. Fish and Wildlife Service to take over the property. 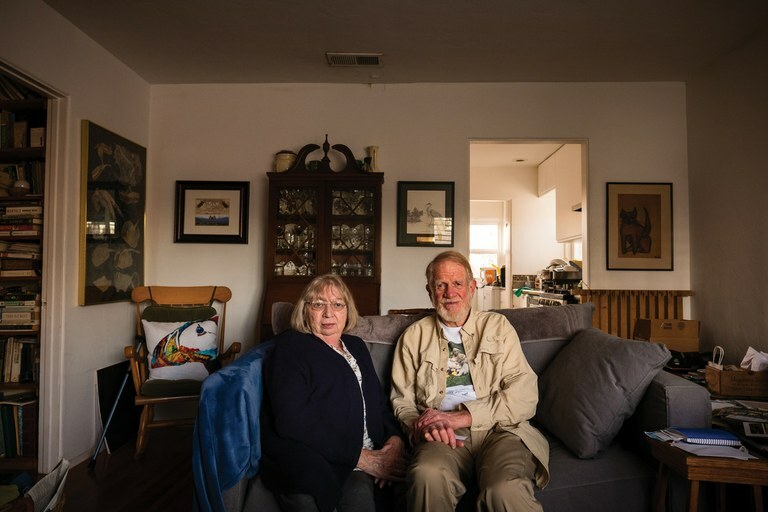 Patricia and Mike McCoy are well-known Imperial Beach environmental activists who played a key role in saving the Tijuana River Estuary in the 1970s, when developers had plans to drain it to build a yacht club. That year, Imperial Beach voted in favor of the marina project. Soon after, however, Fish and Wildlife unexpectedly announced it was purchasing 500 acres of the estuary from the marina developer. The state of California joined the effort, and in early 1981 the National Oceanic and Atmospheric Administration chose to make the site a national sanctuary, thereby preserving that last stretch of coast and marsh. The estuary represents an old-fashioned example of a kind of managed retreat, albeit retreat from a proposed development, not the movement of an entire edge of a city. Still, four decades after their fight began, the McCoys are fully aware that by saving their local estuary they set an important precedent for the city. Residential land impacts forecast for various levels of sea-level rise, from the 2016 City of Imperial Beach Sea Level Rise Assessment. THE LATEST PROJECTION by the Union of Concerned Scientists lays out a scary scenario, particularly for homeowners: Persistent flooding will lower property prices in some areas, while flood insurance premiums will rise. If insurers refuse to cover risky properties, the state will have to become an insurer of last resort. At least 100,000 beachfront homeowners across California face the risk of chronic flooding or worse by the end of this century. As its real estate values decrease, a city’s property tax base, which funds infrastructure, schools and climate-adaptation measures, will also shrink. Given this, managed retreat makes a lot of sense. Yet I had a hard time finding locals who would fully endorse Dedina’s plan. I contacted six realtors and homeowners along Seacoast Drive, where Imperial Beach’s most expensive, and at-risk, properties are. Most refused to discuss the likelihood of a flooded future, fearful of saying anything that would jeopardize property values. But sea-level rise was on the minds of the five Imperial Beach residents I spoke to off the record, people who’d witnessed persistent flooding in their properties and who were either trying to sell or at least considering it. With talk of sea-level rise and the possibility of a managed retreat, many beachfront property owners in Imperial Beach are deciding to sell. This spring, I attended a “Resilient Imperial Beach” meeting, organized to engage residents and homeowners on Dedina’s coastal management plan. We were presented with various climate-adaptation options, including managed retreat and further sand replenishment. We were asked to fill out a form, answering questions like “What is the most important challenge facing the City?” and “What does preserving Imperial Beach’s small beach town character mean to you?” Then we were told to drop those forms off at a box by the back of the room. City council members stood around, ready to answer questions. The meeting was poorly attended; altogether, fewer than a dozen locals came. As I left the meeting, I saw a large map of Imperial Beach mounted on an easel against the back wall. It showed about a third of the city awash in a bright royal blue — a blob of color that began at its contours, including Seacoast Drive, and expanded towards the middle. It showed the parts of town that will be underwater someday, including areas more than 10 blocks away from the coast today that house two of the city’s elementary schools and most of its working-class neighborhoods. As the sea level rises, flooding in Imperial Beach will affect more than the wealthier residents along the coast; it will touch everyone, regardless of location and class. 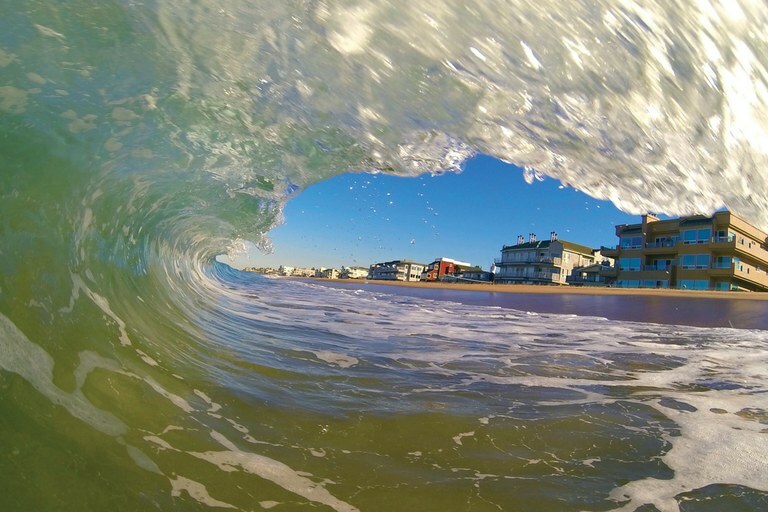 Imperial Beach, California, framed by a wave. The sea level is expected to flood the area consistently by 2050. LIKE THE MCCOY'S BACK IN THE 1970'S, Dedina is waging a huge environmental fight of his own, looking beyond Imperial Beach for possible answers and financial support. Last year, he took his fight to the courts, joining five other California cities and counties in lawsuits against 37 oil and coal companies, including ExxonMobil, Chevron, and ConocoPhillips, arguing that they should be held responsible for the coastal flooding that will cause hundreds of millions of dollars in property damage. Earlier this summer, U.S. District Judge William Alsup dismissed similar lawsuits by San Francisco and Oakland, arguing that climate change impacts deserve a solution “on a more vast scale than can be supplied by a district judge or jury.” But Imperial Beach’s lawsuit is expected to proceed in state court and is currently under appeal. When I spoke to Dedina, he told me he hadn’t lost hope. The lawsuit had forced a public court proceeding on climate science and, at the very least, recognized that it is real and valid. Meanwhile, the city is moving ahead with its planned retreat, though on a considerably smaller scale: by identifying the best future stormwater drains and mitigation basins. “First, we’re going for the low-hanging fruit,” Dedina said. “We have new storm-water regulations, so we want to upgrade them for the future.” But there are no solid plans yet for an eventual move inland. The money is not there. And city officials haven’t had a lot of conversations about this with homeowners yet. “It’s very clear, in the long term, there really isn’t any other strategy that will work,” Dedina told me. “That’s something that people in the future are going to deal with, but we’re going to have to set the framework for that now.” We stood a block away from the shore, on a breezy, low-tide evening. Families strolled along the beach, and cars drove up and down Seacoast Drive. Along the pier, men were fishing, casting their lines into the peaceful, unrelenting, rising sea. Note: This story has been corrected to reflect that Imperial Beach’s federal lawsuit seeking to hold oil companies responsible for damage caused by climate change was lowered to a state court, not dismissed. Contributing editor Ruxandra Guidi writes from Los Angeles, California. Email her at [email protected] or submit a letter to the editor.